Having a locker in the school premises is a choice that never fades away with time. Each and every year, a new batch of students thrive in the school premises and these storage options prove to be an effective investment for the management. Apart from providing a place to store things, they also help in creating a level of discipline, bring in security as well as teach some important life lessons to the students. Here life lessons refer to being accountable, managing time, being responsible and many such lessons that prepares a student to face life. Having said this, you will come across a wide range of school lockers options floating in the market. A variety in the school storage options often makes it difficult for the management to choose the best from the rest. Sometimes it often lands them with the standard lockers instead of trying out something new. Today, let me familiarize you with some of the storage locker options that could be considered for your primary school students. Read on to find out. Below mentioned are a few storage options that can be considered for your primary school students. As the name suggests, cube lockers are designed in the shape of a cube. This would prove to be the perfect storage option for the primary students. Apart from safety and security, this will be quite convenient for the students due to its stature. The problem of accessing their respective lockers due to height could be evaded through this storage option. Moreover, as it is small is size, it won’t take much space, making it easy for the management to save on space. The Standard Probe Locker is the most basic and accepted locker options that have been in demand since its inception. Going for standard probe lockers would also be a fruitful and relevant option to consider. Similar to other storage option, you will have the power to choose between size, color, stature and material. When it comes to assigning a storage option for your students, lockers that are made from plastic would be a commendable choice. Being light in weight and easy to transport, you will be having the privilege to own storage solutions that are effective in nature. Being bang proof and scratch resistant, this type of storage option is yet another important storage option for primary school lockers. Students love color. 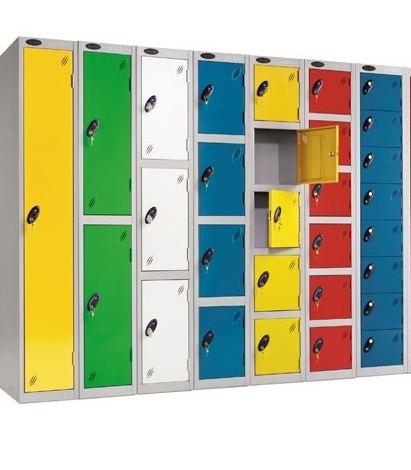 How about giving a funky and vibrant look to your school premises with the color range locker? Sounds interesting, isn’t it? With the color range storage option, you can very well break the stereotype of same colored storage solutions gracing your school premises. This will not only add to the decor, but will also contribute towards creating a vibrant and positive atmosphere in the school premises. You will come across a variety of color options which can be judiciously picked over as per your requirements. Low-level single compartment locker could also be another effective and reliable storage solution to be considered for the primary school students. Their tiny stature will prove to be a comfortable option for the students to access their respective lockers. How about making it easy for the students by providing them a clear see-through storage option? Such type of locker makes it easy to view the things that are stored inside it. This will make it easy for the students as they need not be confused about finding their respective lockers. Also, it will be easy to keep a watch on what is being stored inside the locker. This will help in keeping the school premises safe and secure. Quarto lockers are small cube lockers that are bolted together either horizontally or vertically. Moreover, the quarto lockers can be easily transported from one place to another, a perfect storage option for a space-optimized locker solution. Having said this, a quarto locker would be another convenient option that could be considered for your primary school students. Above-mentioned are the different locker options that could be taken into consideration for choosing the best primary school lockers. These are not only convenient but also cost-effective in nature. So, what are you waiting for? Go ahead and lay your hands in some of the most efficient and relevant storage options for your primary school students. This entry was posted on Monday, July 9th, 2018 at 6:25 am	and is filed under Lockers. You can follow any comments to this entry through the RSS 2.0 feed. You can leave a comment, or trackback from your own site.